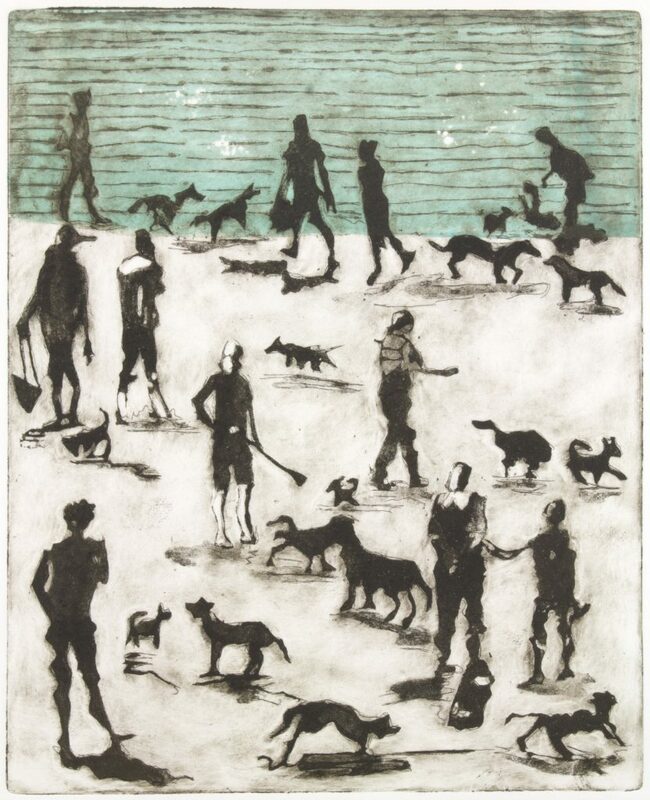 “Beach Dogs” is an etching & aquatint on copper plate. Inked in sepia with an aqua blue applied by gel roller to top third of print. Printed on Somerset Satin. 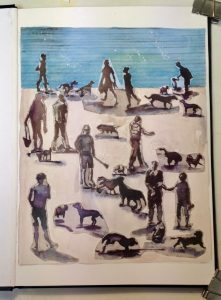 The idea for my etching came from sketching on the beach in South Devon, summer 2016. This piece is part of a series of prints using the same colours. Subjects are either in water, by water or floating in the air or space. There’s often a moon and usually a dog somewhere! When I had my design, I transposed the image onto my copper plate. I have been drawing all my life and remember scribbling away contentedly for hours with felt pens and paper as a child. My plan for 2018 is to set up a press at home so I can play and experiment to my heart’s content. I’m concentrating on developing my work next year rather than worrying about exhibiting and competitions, but expect to show with SGFA , Society of Women Artists at Mall Galleries and Chelsea Art Society. This is the 5th time I’ve taken part in the Annual Open Exhibition. It’s always a lovely exhibition to take part in and every time I find that I’m inspired and impressed by the work of my fellow SGFA colleagues. I’ve been very lucky and won “Highly Commended Print” three times now and “Best Themed Work” one year. It’s great that it’s judged by independent artists and people from the art world. I gives me encouragement that I’m on the right track. A Graphic Design graduate from Brighton College of Art, Sally is a painter and printmaker working full-time from her Thames-side studio in West London. Her work is inspired by music, literature and the human condition – with all its vulnerability. Drawing is at the heart of her work. 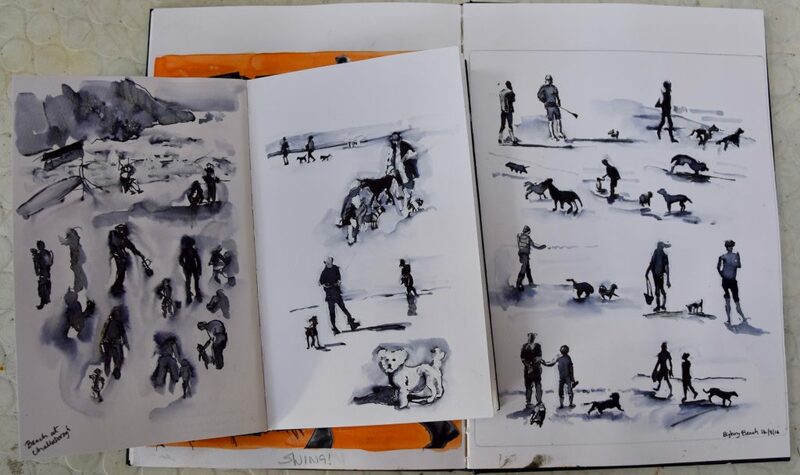 Often drawing wet ink and charcoal into wet watercolour. Moving oil on metal plates to create painterly effects. She likes to experiment with different mediums – choosing whatever materials will bring her subject to life. Sally loves the “happy accident” in her work and juxtaposing, layering and interweaving imageryAlthough Sally’s work has a strong narrative content, there is always something unexplained, mysterious and strange. There is a strong design influence in her work, from her experience as a Layout Artist and freelance Graphic Designer. Sally often uses collage to plan her works, for its immediacy, strong shapes, surrealist and humorous potential. 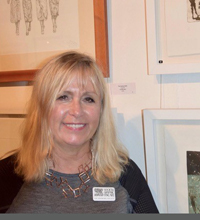 Sally is both an elected Associate Member of The Society of Women Artists and The Society of Graphic Fine Artists.